As a Christmas gift from the kids to their Grandmothers, Godparents, teachers and VIPeeps, we collaborated on a hat project. The gift portion was the photo tag (shown above) attached to a kid-made winter hat ornament (click the link to see the tutorial from Goodknits). The mom-made portion of the gift was to crochet hats to donate to our area homeless shelter. I decided to make a number of sizes and patterns to make it more fun (and to fit more people too). First up is the Ribbed Wrapped Cap For Kids. I really liked this pattern and it was an easy one to do in front of the tv or while other things were going on. The hat is pretty thick, so I think it will be nice and warm. I made one a little bigger than the pattern to fit my own head, so three kid-size and one mom-sized in this pattern. Another pattern I tried out was the Men's Ribbed Hat. This one is the warmest hat by far and Matt really wants one of his own (it's that cozy). The folded brim makes it super adjustable for any head size and it seems to have a good stretch too. The pattern is a little monotonous, but it was a great one to work on while I listened to my first audiobook. The blue blob on the right is in progress here, but eventually became a finished hat. The Easy Peasy Woman's Winter Hat is a great basic hat pattern, but it can be kind of hole-y when worn. I feel like it's more of a fashion hat than a keep someone warm outside in sub-zero temperatures hat. It was a simple pattern though, so I made one woman's sized hat and then three kid-sized hats (using EJ as a sizing guide). With my last few skeins of yarn, I wanted to try some new patterns. The top two hats are from the Basic Guy Hat Pattern. The top left is similar to the Ribbed Wrapped Cap but in a much larger size. The top right is simple in that it is mostly just single crochet. Both patterns made very thick and warm hats. The bottom hat is the Crocheted Ribbed Hat. Again it is similar to the Ribbed Wrapped Cap but with a very different brim. It was fun to try each of these patterns to mix it up a bit. 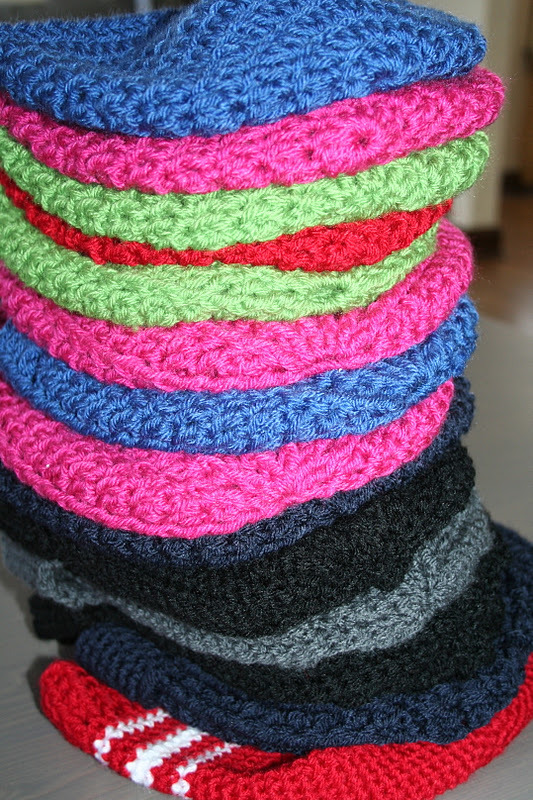 In the end, fifteen crocheted hats are heading to the shelter next week (along with a crocheted scarf and several store-bought hats and gloves). 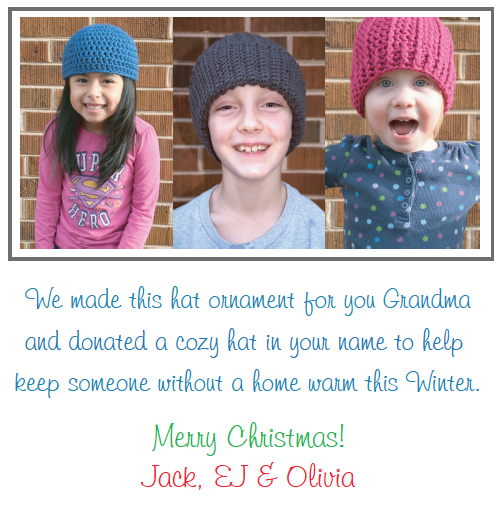 This was a really fun project to do together (the kids worked on their hat ornaments while I crocheted) and it was fun to do a gift this year where we donated something we made (in the past we've done a monetary donation as part of the kids' gifts). Clearly, I need to collaborate with my kids more often! That is such a nice project, and I love how everyone is able to get involved for a good cause. Congrats -- the hats look great! What a great idea! Love all the colors, etc. You do such a great job at incorporating the kids in your charitable giving. You and your babies did great work!!!!! Great hats! And what a great gift (to the homeless recipients, and to your kids!). Seriously, I'm tempted to wear one of those hates even indoors. Nice work! Wow, what an accomplishment! I love the picture of all of the hats together, amazing! This is so awesome in so many ways! It is great that you involved the kids in such a worthwhile project to help a good cause. The hats all turned out great! Great project and good life lesson with the kids. Wish more parents would do things like this. Very nice. Good mound of hats there, keep up the good work.